The Reformed Church in Hungary’s implementing partner in the Refugee Ministry, Kalunba Social Services Ltd. has joined other NGOs in providing support in organizing the details leading to the grand opening of the choir which started rehearsals at Scottish Mission in Budapest on 24 February 2018. Kalunba became involved after Frederick Odorige, the coordinator of the choir, contacted the organization and other organizations for cooperation towards encouraging staff, volunteers, and clients to join the choir. Kalunba has also provided the connection in which allowed the choir to begin rehearsals at the Scottish Mission. Other NGOs were contacted and have also responded to the call, including Mahatma Gandhi Human Rights Association, Mighelp Association, UNCHR and African Foundation. Many members of the choir have joined through their association with these organizations, and five staff members of UNHCR have joined the choir as well. The choir is operating on the platform of Odorige’s NGO, Nelson M46664 Human Rights Association. With the combined strength and experiences of the organizations mentioned, the choir was created on a common platform. The Hungarian Refugee Open Choir is open to all, regardless of nationality, race, religion, and political view. It is dedicated to becoming a place of tolerance towards those who seem to be different. Odorige believes music is one of the methods of bringing together people of diverse cultures. Music provides a means by which people can share emotions, intentions, and meanings, even when spoken language fails to do so. Through music, people of different cultures and languages may communicate and begin to understand one another. At the opening rehearsal of the choir, while learning a traditional Hungarian song, Székely recognized a young man, a client of Kalunba, and saw that he was not comfortable singing and thought to herself that this man must not be able to sing, so that is why he is uncomfortable. During a short break, she noticed the man run out. A little later, he returned with an instrument in his hand. In the second half of the rehearsals, the young man taught others in the choir a Persian song. In that moment, Székely saw the sparkle in his eye as he sang, with a beautiful voice, the song of his homeland. Through this experience, Székely saw the blooming expressions of the young man, a man she had known to have been going through some personal struggles in adjusting to life in a foreign country. She saw him in a new light, filled with excitement as he shared his song. During rehearsals, choir members learn new songs, singing and laughing together, as they share traditions and cultural values from their home countries. Anyone who wishes to teach a song, are invited to do so freely. On the day of concerts, those that taught the songs from their countries will dress differently from the other members of the choir by putting on the traditional costumes of their tribes. 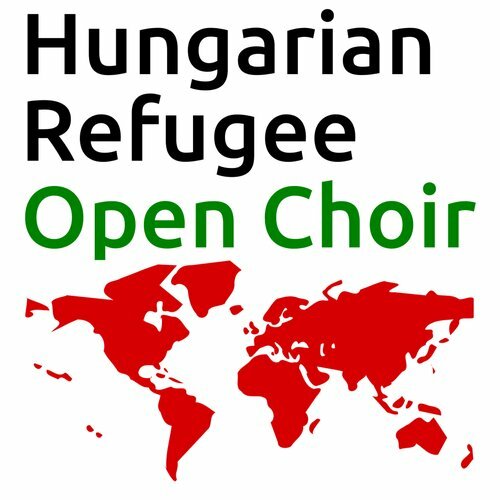 In three months, Odorige wishes for the Hungarian Refugee Open Choir to learn 20 songs from different parts of the world, and someday become a traveling choir, performing throughout Hungary in free concerts for all those who would listen. His goal is for the choir to consist of 100 adults, and then create a separate children’s choir for 50 children. The Hungarian Refugee Open Choir rehearsals are held every Saturday from 15.00-17.00 at Scottish Mission in Budapest. New members are always welcome to join the choir. If you would like to learn more, you can find their Facebook page here.